We have been using Pampers Kandoo flushable wipes since Zoe started potty training (about 3 years ago now). They are a staple in our bathroom (upstairs and downstairs). We all use them now. We love the little Kandoo froggie... and giggle whenever we notice his little picture. (How can you not giggle at a frog wiping his tush with a wipe?) Zoe actually has trouble going to the bathroom is she knows we're out of the wipes (help!). I try very hard to make sure we've got a supply of these at all times. 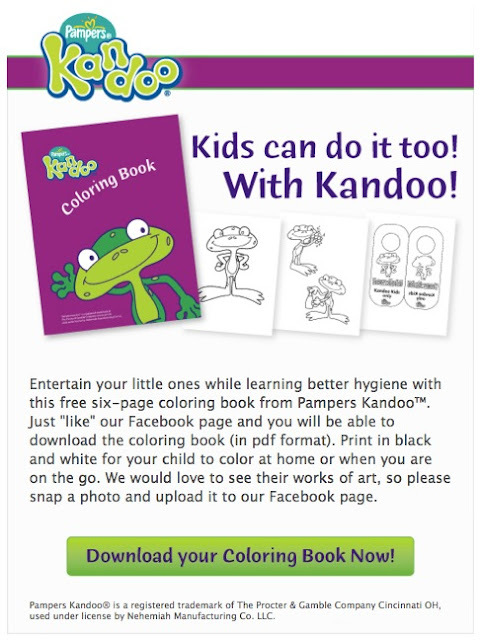 Right now, kandoo is offering a free printable coloring book on their Facebook page. All you need to do is "like" them and these fun coloring pages are located on the left side bar in a link. I've already downloaded my copies. Both girls will be happily coloring Kandoo all afternoon. Like I said... we really love the Kandoo froggie! - the pop-up wipes REALLY pop-up. - the refillable box is really easy for the girls (even 2 1/2 year old Ana) to open on their own. - they have a pleasant scent. - if you go to the website they almost always have a coupon available. - I have trouble finding the refill packages. Our grocery store seems to have stopped carrying them. I was actually worried they were discontinuing the product... or changing it. - If we run out of flushable wipes a certain 5 year old in our house just about refuses to poop. I really don't have any other negatives about them. Pampers products seem to come through for me every time. It is annoying that I have to actually search for them. I came across a couple small cases of them at Target a couple weeks ago and bought 2 boxes. Nick thinks I'm crazy... but we may not need to buy more Kandoo wipes for the rest of the year! If you haven't tried Kandoo... I absolutely recommend them.